Preheat oven to 400F and coat 8" square glass baking dish with cooking spray. Prepare fruit pudding by whisking water, cornstarch and 1/3 cup sugar in medium saucepan over medium heat. Add fruit and stir, cooking for about 3-5 minutes until fruit is coated with glaze. Sift together flour, 1/2 cup sugar, baking powder, spices, and salt into medium bowl. Whisk together egg, milk, melted butter, and vanilla in a large bowl, then whisk in flour mixture until just combined. Reserve 1/2 cup fruit mixture. 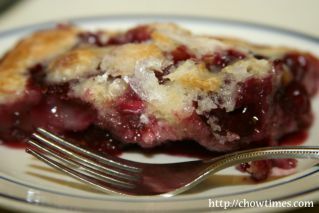 Add remaining fruit to baking dish and pour batter over it, spreading evenly. Place reserved 1/2 cup fruit mixture in center of cake, over batter. Bake until a wooden pick inserted into center of cake portion comes out clean, 25 to 30 minutes. Cool in pan on a rack 5 minutes before serving. While the local (and Original) Farmers Markets are still brimming with the last of the summer fruit varieties, this week our recipe is for one of the best cakes on the planet ... so much so, that I honestly call the strawberry variation The Crack Cake. It sits there on the kitchen counter, calling my name. I have to keep going back for one more hit ... until it's gone or better, until I give most of it away. Thankfully, eager takers are always standing by. This simple recipe can be prepared with any fresh fruit, all year-round, using your seasonal favorites. Variations can range from Mixed Berry (red and blue for patriotic holidays or, to celebrate a loved one's new US Citizenship, as I've done! ), Cherry-Pear (frozen-thawed or canned cherries work well), Spiced Apple-Raisin; Lime-Mango-Coconut, Peach-Blueberry, Nectarine-Raspberry, and so on! Thanks to Epicurious, the original recipe for Strawberry-Rhubarb Cake was the base I used to make the cake one Sunday morning two summers ago. My generous friends at Farm Fresh insisted on sending me home that Saturday, with a bumper crop of fresh strawberries, after I'd sung their praises to guests on my Melting Pot Food Tour of the Market. Having no rhubarb in the house, but hosting all of the other ingredients readily, I whipped up a fresh strawberry cake before breakfast. I used almond milk instead of whole milk (I have also used cream on occasion ~ sublime! ), and dolled it up with some spices. The love affair began. Actually, the obsession began. With your first taste, you will understand why. Just substitute any fresh fruit you'd like for the strawberries in this recipe. 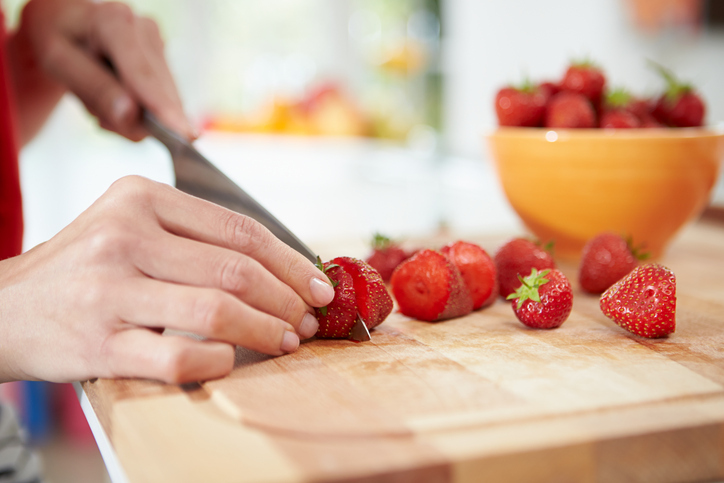 Cut fruit in equal-sized chunks, leave small berries whole. It's not necessary to peel the summer fruit, but I usually peel apples and pears. Make up your own variations and, be sure to share with loved ones or, not. A friend of ours is getting this cake for her birthday this weekend. Shhh, it's a secret! It's incredibly delicious served warm and, I am here to tell you that also at room temperature or even cold, it will never disappoint ~ enjoy!